The Canberra Class Landing Helicopter Docks (LHDs) are two 27,800t ships constructed for the Royal Australian Navy (RAN). 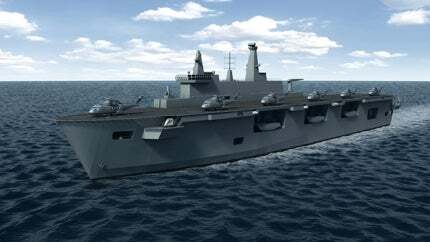 An artist's impression of Canberra Class LHD of the Royal Australian Navy (RAN). The Canberra Class LHD can carry 12 rotary wing aircraft. A top view of the Canberra Class Landing Helicopter Dock (LHD). The Canberra Class LHD is powered by a combined diesel and gas turbine (CODAG) propulsion system. The Canberra Class landing helicopter docks (LHDs) are the largest vessels ever constructed for the Royal Australian Navy (RAN). Navantia and BAE Systems Australia constructed two 27,800t ships of the class under the Joint Project 2048 Phase 4A/4B. BAE Systems Australia is the prime contractor for the $3bn project, while Navantia is responsible for the design and construction of the ships. The two Canberra class LHDs, HMAS Canberra and HMAS Adelaide, were commissioned in November 2014 and December 2015 respectively. The ships replaced one of the Kanimbla Class landing platform amphibious ships and the Tobruk landing ship heavy (LSH) vessel. The Canberra Class LHD can transport more than 1,100 troops, 100 armoured vehicles and 12 rotary wing aircraft. "The Canberra Class LHD can transport over 1,100 troops, 100 armoured vehicles and 12 rotary wing aircraft." The Canberra class ships incorporate a conventional steel mono hull with the superstructure placed on the starboard side of the flight deck. The shallowest possible draft allows the LHD to operate in shallow waters that are common in the littoral regions. The ship comprises four main decks, including well deck and heavy vehicle deck, main accommodation deck, hangar and light vehicle deck, and flight deck. The ramp at the stern of the ship provides access to the well dock. The heavy vehicle/cargo deck is accessed through two lateral ramp doors on the starboard side. A fixed ramp on the port side allows the vehicles to move between the heavy and light vehicle decks. The well deck normally accommodates four LCM 1E amphibious landing craft. Four additional rigid hulled inflatable boats (RHIBs) can be carried during emergency situations. The well deck is also capable of housing landing craft utilities (LCUs), amphibious vehicles and landing craft air cushions (LCACs). The LHD has an overall length of 230.8m, a moulded beam of 32m and a draft of 7.08m. The full load displacement is 27,500t. The ship can complement a crew of 400, including the watercraft and flight deck crews. It is jointly operated by crew from the Navy, the Army and the Air Force. The Canberra class ships were built using a modular construction approach. Each module was built and fitted out as a separate unit, before being assembled to form the complete ship. The process accelerated the construction as the modules were built at different sites across the shipyard before being brought together for final outfitting. The construction of the body from the hull up to the flight deck was carried out at Navantia’s Ferrol-Fene shipyard in Spain. The hull was transported to Williamstown dockyard in Australia for the installation of the island structure. The construction of the first ship, HMAS Canberra, began in late 2008. Her keel was laid in September 2009 and the ship was launched in February 2011. The first steel was cut for the second ship, HMAS Adelaide, in February 2010. HMS Adelaide was launched in July 2012. The flight deck is 202.3m-long and 32m-wide. It allows the operation of the rotary wing aircraft of Australian Defence Forces (ADF), such as NRH-90, CH-47 Chinook, Blackhawk, Seahawk, ARH, and Future Navy Aviation Combat System. The deck is provided with six spots on the port side to support the simultaneous operations of medium-sized helicopters. The flight deck also allows the takeoff and landing of four CH-47 Chinooks simultaneously. The aircraft elevator at the aft of the flight deck can carry large-sized rotorcraft such as the CH 47. The medium-sized helicopters can be accommodated by the elevator at the forward of the island on the starboard side. The hangar facility and the light vehicle deck are co-located between the flight deck and the accommodation deck. It can accommodate up to eight medium-sized helicopters. The storage capacity expands up to 18 medium-sized helicopters when the light vehicle deck is also used. The Canberra Class LHDs is equipped with a Saab 9LV combat management system (CMS). The system performs threat evaluation, engagement planning and weapon-assignment missions. Elbit Systems was awarded a contract in October 2012 for supplying Battle Management Systems (BMS) to be integrated into landing craft aboard the LHDs. Each Canberra class ship is armed with four 20mm automated guns, six 12.7mm machine guns, an anti-torpedo towed defence system, and Nulka active missile decoy system. The sensor suite contains a Sea Giraffe 3D air search radar, helicopter control and surface radar, and navigation radar. Other systems include Sagem infrared search and track (IRST) System, and Rafael gun and electro-optical sight (EOS) system. "The ship can accommodate up to 1,400 personnel including 400 ship’s company and 1,000 embarked troops." The Canberra Class LHD is powered by a combined diesel and gas turbine (CODAG) propulsion system integrating LM 2500 gas turbine and two MAN 16V32/40 diesel generators. The ship is also equipped with two Siemens azimuth thrusters and two bow thrusters. The shipboard power is supplied by a Progener-Mitsubishi S16MPTA 1,350kW emergency diesel generator. The propulsion system provides a maximum speed of 20k and a range of 6,000nm. The ship can accommodate up to 1,400 personnel, including 400 ship’s company and 1,000 embarked troops. The crew accommodation facilities are located in the main accommodation deck and crew cabins, messing, medical rooms, galley, office spaces and recreation facilities. COFI has 35 years of experience fitting Italian and foreign navy units, with a specialism in the design, manufacture, supply and installation of fluid-transfer components for onboard plants.